We do our best to keep this list updated of known problems with the geocaches in our book. 6 Salmon Pits Located on private property (no longer there). In 2011 The Valemount Historic Society applied for a Community Initiatives grant through the Columbian Basin Trust to publish a pamphlet to sell to the public for $6 each. The pamphlet is called Historic Hikes in the Robson Valley and it documents 15 self-guided hikes with hand-drawn maps and GPS coordinates to heritage locations in the area surrounding Valemount. The guide gives visitors (and residents) a glimpse into the lives of people here a century ago who were constructing the railroad, logging, outfitting, fishing and gathering for the winter and living in Internment Camps during the Second World War. Each destination has one or perhaps many artifacts that remain on site offering interesting and unique photo opportunities in the spectacular setting of the Robson Valley. 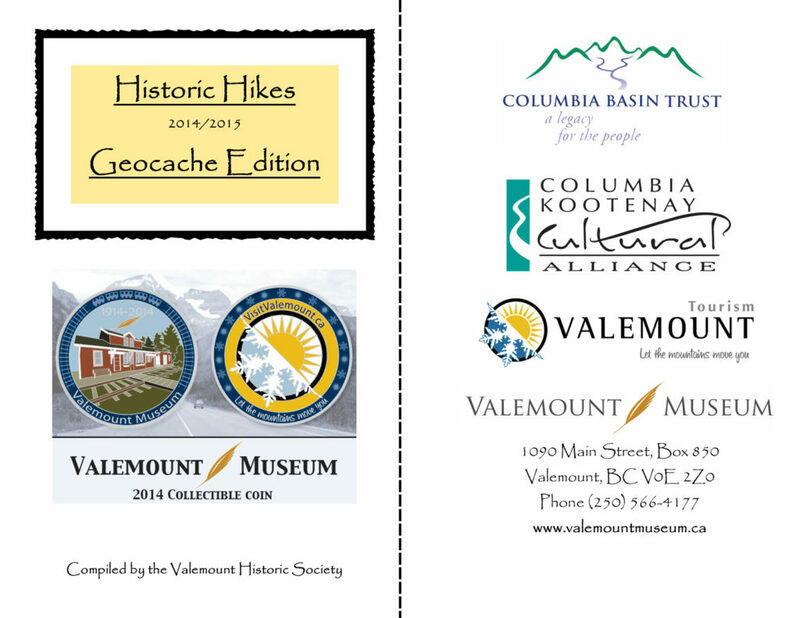 In 2014, partnering with Tourism Valemount the VHS received a grant from the Columbia Kootenay Cultural Alliance to add a very modern edge to the guide to historic places by having each of the hikes geocached. The guide is being produced in a “GEOCACHE EDITION” and is available for purchase for the same amount. In each booklet there is a stamp grid and at each site there is a geocache that contains a unique stamp and stamp pad (among the other items that are for trading within the caches). 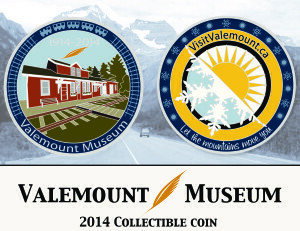 Once a hiker collects 10 stamps on their grid they can return to the Valemount Museum to be given a beautiful geocoin showcasing the 100-year-old Heritage Railway Station Museum. This is a “first” for the Valemount Historic Society, and a great way to combine history and modern technology, hopefully drawing a new audience toward heritage interests. The booklet will be available for sale at the Valemount Museum as well as in the Valemount Visitor Centre and at Infinity Health and Office in Valemount BC. Our “Historic Hikes – Geocache Edition” booklet is available in our retail shop, or for purchase online here.